“THANK YOU, THANK YOU, THANK YOU!!! The blue angel wings arrived a couple days ago, and Ernie almost immediately realized the possibilities! Now he no longer crashes his face into things. The wings are going to give him a lot more confidence. He is getting acclimated to the rescue, and the other dogs, and even managed to catch a gopher! Attached are some photos. Our rescue is pretty remote, and I don’t yet have a smart phone, so we are a little technologically impaired. I hope the photos will be enough for now. I have a friend who is a professional photographer, who is planning to come up soon. I will ask for her help. Thank you so much for all the good work you do. I hope your network might be able to help us find a good home for this sweet little boy. Loving homes for dogs are hard to find around here. “Last week our rescue took in an older red Heeler mix, who is completely blind. He had been chained up (as he probably had been his whole life) and abandoned. Ernie is so sweet and affectionate, but the poor guy runs full tilt into his kennel mesh, and I know it has to hurt. Our kennels are large, and he has probably never before had such freedom to move around. He is probably used to always being stopped by his chain, before he can meet an obstacle. We brought him straight to our vet, who examined him and concluded there is nothing that could be done to restore even a little of his vision. So I remembered your invention, and wondered if it would be possible to arrange to get a Muffin’s Halo for him. 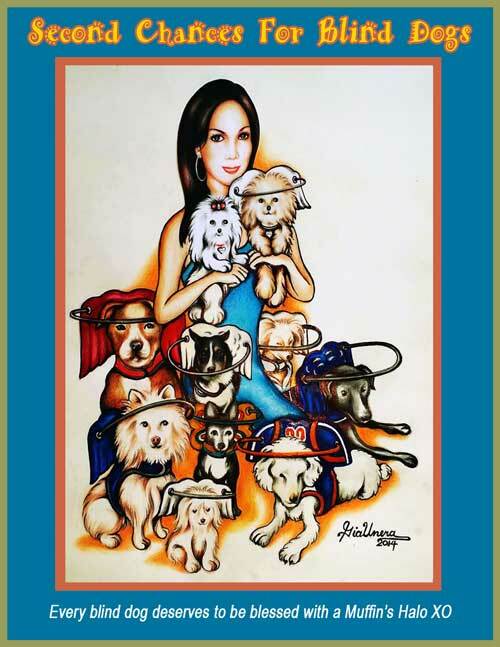 “Brandee’s owner was my neighbor, an elderly gentleman who didn’t ever contact his family and never married or had kids. Brandee was his whole world. He even took her to a doggie optometrist who diagnosed her with SARDS. Which caused her blindness. Brandee’s owner became like another grandpa to me and I always promised him if anything happened to him I would look after Brandee. Well around Easter of 2015 Brandee’s owner was found deceased in his home. Under normal circumstances where someone is deceased and there is a pet and no family the dog will be taken to a shelter. However, I’m a police officer with my local agency so exceptions were made so that I could take Brandee from her house to mine until her owners family was contacted. A few days later her owners niece showed up at my house wanting to see the dog. She said to me if I didn’t want her she’d be taking Brandee to a shelter in Indy. I wasn’t having it. Pipper (Cindy) who was shot in the face is now adopted! 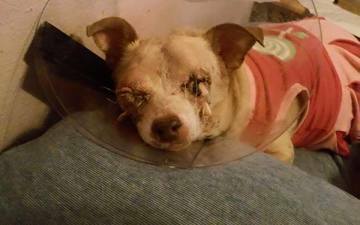 Here is update on Cinnamon “Cindy” who was shot in the face. She has been renamed Piper and has been adopted! Check her out in her donated Muffin’s Halo. She is now leading a bump-free life thanks to YOU. Backstory: “Numerous calls recently began pouring in about a little female dog, with a bloody eye roaming in an area south of town. Though curious, she would never allow anyone to get close to her. Caring passersby would leave bits of food for her at the local market, which she cautiously approached and devoured quickly when no one was watching. When people began noticing her eye getting worse, the urgency to get her to a safe place began to grow. As days passed, she was starting to lose weight. Her steps had become quite clumsy. Her appetite was not as strong. Perhaps she was tired of running. Or perhaps she sensed she needed help. Nonetheless, one afternoon, she gave in completely. She surrendered herself; her weakened little body swayed with each soft wag of her tail. However, it wasn’t until we had her in safe custody did we see the true nature of her injuries. Q-Tip Loves To Chillax Now That He Has His Halo! Backstory: A lady had bought Him from some breeder around this area an decided that she did’t have time for and she wasn’t home that much. She decided this after she had him for about 3 months. I could tell that he didn’t get any attention so I was happy to get him out of there. We had Scrappy the Cairn already so the two dogs like to snuggle. Q-Tip his very smart I taught him to sneeze, speak, dig, scratch my back ,roll over, sit, down and shake. He doesn’t do his tricks that much anymore. We still love him though I found you guys on Facebook and have seen the many dogs you’ve helped. My Q-Tip past away yesterday peacefully. I knew for a while that every was a miracle , he gave me 15 good years. I got a halo from you and he used it will he was getting around I passed it on to a dog Max. I hope they received it. Our sweet blind friend Q-Tip passed away yesterday. His devoted Mom Regina Solomon paid his Muffin’s Halo forward to blind dog Dexter who we posted earlier this week. Our deepest condolences to Regina Solomon. Mister is Now Smiling his halo! Here is Mister with his new Muffin’s Halo donated by YOU…He says Thank you! Look how precious he looks! Check out pretty Zoey who now has Shadoe’s Muffin’s Halo that was previously passed along by late Mr. Poodle. That is now 3 blind dogs benefiting from this wing filled of love and hope. Shadoe an 18 year old blind maltese who survived Katrina and so many challenges is now at Rainbow Bridge and her mom paid forward her Muffin’s Halo to Zoey. Please consider our little poodle, Zoey, for your generous donation. We started fostering her for a local rescue on the day she was to be euthanized. She had slight cataracts. After a recent trip to the groomers (which I think stressed her too much), she completely lost her sight! The vet said she could have had a stroke. We just moved (on May 10th) to a new home and poor Zoey is having such a hard time adjusting. She constantly bumps into everything! She is a foster success, as we have decided to keep her because I don’t know what would happen to this beautiful 11 year old, blind beauty!!! Thank You For Serving Our Country Service Soldier Asur! Asur was a Military Working Dog (MWD) that I adopted from the Marine Corps at Camp Pendleton, California. After a deployment in Afghanistan, Asur returned home with different health issues. The main issue was with his sight. Asur had developed Glaucoma. A variety of meds could not control the disease. After much bleeding and incredible pain, the decision was made to have a bilateral enucleation. Both his eyes were fully removed and sewn shut. Inside activity limited due to crashing into things. Outside Asur has learned to be off leash on our property and has a better level of activity. Still without commands, while running free, he will run into bushes and trees. Hopefully, the halo will allow him more freedom and less bumps inside and out! “My baby Asur with his halo. He hasn’t been able to be as active as his bomb sniffing days, in the Marines, once he became blind during his deployment in Afghanistan. 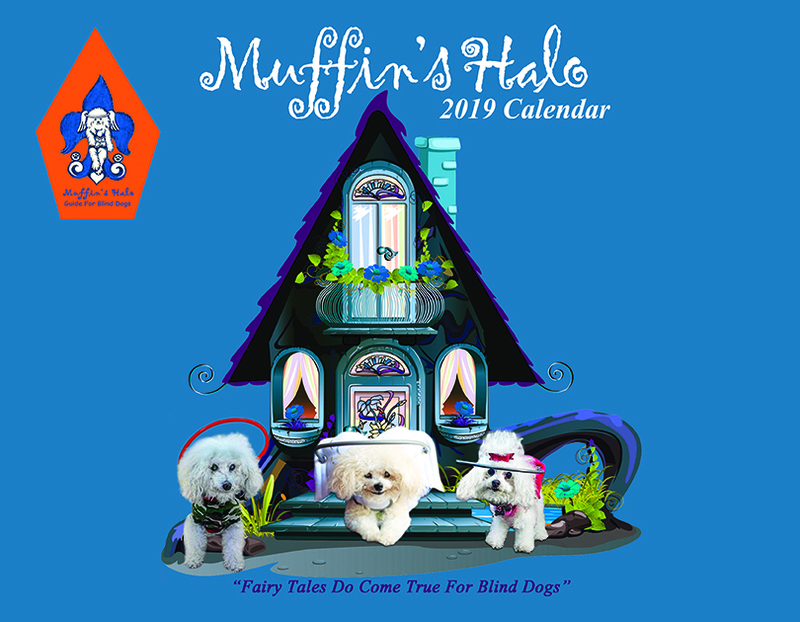 But since, an angel from Second Chances For Blind Dogs donated his Muffin’s Halo Quarterback Style, he has been running all over the place 🙂 Thank you for assisting in his retirement. This K9Hero is very happy~! Chickie got a set of wings! 10 year old Chickie began getting sick in October and, after several tests , meds and appointments nothing was helping and vet said something neurological must be wrong. She went to emergency vet on Christmas and couldn’t blink and was near death. She was left with no eye lubricant for a day and a half before we seen her and brought attention to the fact that her eyes were filmy and dry. Finally they tried to reverse the damage but nothing worked and steroids made it worse and she finally had to lose her eyes. Then our angels stepped in and donated a Muffin’s Halo for this sweet angel so she can now navigate bump-free. He has been wearing his new Muffin’s Halo for just a few minutes and he is already acting more confident and holding his head up higher. Thank you to Muffin’s Halo for Jackson’s new halo. “Here is one of the first blind dogs to get a Muffin’s Halo from Chloe’s Birthday Celebration. Daisy Lu Bounces her way into a forever home with her red halo! Daisy Lu’s story: Daisy Lu has a lot of energy for an 8-year-old, so she might be significantly younger. She’s very sweet and gives lots of kisses. Daisy Lu is a special-needs dog who cannot see, but that doesn’t stop her from enjoying walks, playing with toys and walking around the house with help from her Halo Wings (muffinshalo.com). The wings help her get around new places without hurting herself. Daisy Lu is house-trained and knows what to do when told to “go potty.” She isn’t comfortable around other dogs and would do best as the only pup. 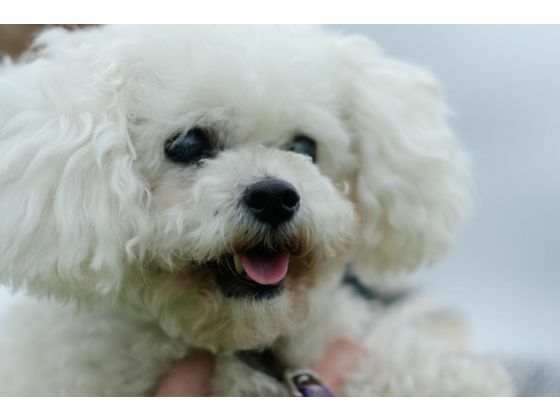 Bichon Rescue of Orange County is hoping to have her examined by an eye specialist to see if she might be able to gain some sight.